I've never been too big on Descartes. That whole sort of essentialist argument has never been for me. I'm a guy who's built furniture out of science fiction novels and travel books and who's played concerts with nothing but a roll of tin foil and a microphone. So I've never been too big on the idea that things exist because they have some fundamental essence. There is no substantial qualitative definition of a blog. Blogs, or rather blogging platforms, just exist. The quality or essence of a blog is given meaning only via what the author does with the blog and how the blog is responded to. And in my mind what this means is that I blog and what I blog -- and how that message is received by others -- tells me what I think. And it tells me how I think. My own blog confirms my suspicions that I'm not the most polite person in the world. My blog confirms one of my old professor's observations that in many ways my arrogance is my most important attribute. My blog reminds me that I'm boneheaded and tin-eared. My blog represents me not as an edited professional voice, but as a human being struggling to express ideas, thoughts, reactions, dreams, and general b.s. via a means that uncompromisingly allows for the immediate feedback of strangers and fellow wanderers. And that's why I think all teachers should blog. A student in my ed class last night -- a young 2nd year teacher in a Baltimore City public school -- said that he didn't feel like he had anything to offer on his blog or on Twitter. He couldn't think of anything in his classroom that he thought would advance the discussion. It is in a way frustrating that he doesn't realize how obviously wrong he is. But, more so, it is indicative of his mindset that he is thinking too much. To blog, you can't always allow yourself to be burdened by overthinking. At times this will lead you to a scary place. A place without a safety net. A place full of prat falls. And sometimes what we think embarrasses us and we must then confront our thoughts and consider whether there are alternatives. This is real maturity. Because real maturity is not about having the right answers, it's about having the audacity to have the wrong answers and re-address them in light of contemplation, self-argument, and experience. This is made perhaps even more evident by the public nature of the blog, and that is one of the foremost reasons all teachers should in fact blog. Because to face one's ill conclusions, self-congratulations, petty foibles, and impolite rhetoric among peers in the public square of the blogosphere is to begin to learn to grow. And to begin to understand that it's not all about 'getting it right', but rather is a matter of 'getting it'. We live in a culture that tells us that you learn from your mistakes, yet which continually punishes and shuns those who make mistakes. It is teachers who have the power to change this. It is teachers who have the power to teach a generation that to fully live and to fully know one's self is to fully live and to fully know one's self in the public conversation. And that to be wrong or to come off as shrill is not always a bad thing; because those too are forms of experience and in reflection they too are to be learned from. And so, we should teach this new generation to move beyond embarrassment and fear. This is not to condone manifestly insolent behavior online, rather in teaching the qualities -- the unique qualities -- of the globally connected public square, we should be instilling in students both a strident determination to take part in the unadulterated public debate and yet have humility. I think both are achieved through the crucial practice of critical thinking and earnest self-analysis. And no where, if sincerely met with daily conviction, can both be better employed than in the practice of blogging. And so, I firmly believe that all teachers should be bloggers. Because if Descartes is wrong, then the thrust of our identity is determined not by our inalienable and essential state of being but by the differences in idea and sense that we demonstrate through our interactions with others. And teachers, perhaps more than anything else, are the medium -- or have the potential to be the medium -- through which students learn about all that which is 'other'. This is the post I wish I had thought to write... in fact, I'm thinking you've inspired me to toss in my own bit here sometime soon. Because really- it IS hard to explain life behind the wheel of your own personal blog. It is almost one of those things that you just have to do to get. "...to blog is to teach yourself what you think." That's golden. I feel this way because this might be the simplest way to describe blogging (or rather, owning, writing and managing your own blog and your own voice within) as one of the most constructivist types of communication in existence. Thanks from a teacher who has always felt they did not have much to blog about. I have been trying to be more of an active participant by offering comments, but perhaps I should just write. I loved "We live in a culture that tells us that you learn from your mistakes, yet which continually punishes and shuns those who make mistakes. It is teachers who have the power to change this." Great fodder for professional debates over the unintended message that grading policies can send. I look forward to using this quote when I get back in the classroom. "Because to blog is to teach yourself what you think" is very powerful and very true. Thank you for posting this. Thank you for this! I will certainly link to this posting from my blog, to help my readers (many South African teachers) appreciate the value of blogging. I love the perspective you give! This is an excellent post. I know I've fallen victim to that same misconception about not having anything important enough to say. I've passed on this link to the faculty at my campus, as many of them wonder about the need or use of blogging, too. To blog is to teach yourself what you think? Far-fetched I'd say. To blog is to put your thoughts black on white. But I completely agree that everybody has something to offer in their blog. Let's blog then! 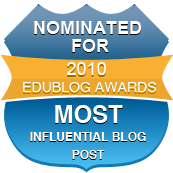 Nice job, this is the best endorsement for educator blogging that I have seen in some time! Does it not apply to why students should blog too? As a teacher who has faced some teasing from other staff members for blogging and enjoying it, THANK YOU! "And so, we should teach this new generation to move beyond embarrassment and fear." Thank you for this post. I will use it with my students who are very reluctant to start writing publicly - they would rather just do the old-fashioned 'privately writing a piece of paper only to the teacher' -style and hide their work from their peers, or anyone else. Personally, I enjoyed reading this very much, too! Gives me new reasons and energy to keep blogging. I concur...I recently had a similar sort of epiphany while watching "Julie and Julia" for the second time. I went straight home and wrote a post on my professional blog called Bloggers are Writers for Real. I feel like the cognitive benefits of me writing about my reading, thinking, and teaching have helped me in the classroom AND help my students connect with me on another level. Thank you for your wonderfully reflective and engaging post. This piece made me realize that I really do like you:). Thanks for posting this! I just started a blogging project with my students, and, like some of them, I have been feeling nervous about putting myself out there. Your thoughts have given me the confidence to go forward. I can't wait to share this with the kids! Thanks for some very insightful remarks on blogging. I truly appreciate your candid and gut-honest approach about how our blogs can teach us what we think as well as reveal some truths to us about the kind of person we are. I will also be quoting you on this topic. Way to give me no excuse to skip out my blogging right when I needed it. Thank you! I just found this blog tonight, exhausted from the day, and still doing 'stuff' for my kids and class tomorrow...but this space, your words, feels like 'coming home'. Your posting about why teachers blog is dead on. I started because I felt I could no longer ignore the nagging sense that I must contribute! So as I move technophobes to technophiles in my little sandbox of the educational world, and as I write my own blog, I am enriched by yours. Thank you. I think this fantastic. the teachers get a voice other than in the class room,it gives them the confidence that they need to blossom and bloom.it would be interesting to draw the statistics as to how many teachers can actually speak publicly.blogging will give them the confidence and chance to speak to themselves and others. Parents who do have Internet access, a teacher with a blog becomes a more effective communicator. The purpose of the slide show is not to say that teachers shouldn’t make phone calls home, it is about showing teachers that having a blog does have benefits. Creating more ways for teachers and parents to communicate is a good thing. You are exactly right...hit this one square on! I have just started a blog of my own... Thing is..I will be very disheartened if I get zero readers! This is the thing about blogging...one does it in order to have a voice that is heard! "To blog is to teach yourself what you think" OR what you think you think, or thought, might be a better description of a blog. That's why I blog. I've noticed some communicators and teachers commenting here said they were afraid to put themselves out there into the blogosphere. Having been a pupil for a long time, I can honestly say I've seen arguments/near brawls break out in the college classroom over sociology issues. If this is the case for some teachers because they are afraid of what somebody might think about what they wrote or thought, they must get over this fear. Blogging is about NOW. It is still cool to blog and will continue to be cool. You cannot be afraid to get "beat up" because somebody didn't like what you wrote. Thank You for providing the link to this blog via your DIGITAL NATION/You Tube Video. That's how I arrived at your blog. Now, I like your blog so much I'm adding it to my blogroll. This is what blogging is all about. You do what you want on your blog. You say what you want to say on your blog. Then you press publish and send it and share it out into the world. Keep up the good blogging work, keep sharing and don't let the bullies scare you. I'd like to share this. I finally got a class of students to start blogging for the same reasons you mentioned : to give themselves clarity in thought and feelings, to learn as one, to make mistakes in a safe, supportive environment. I think they will be happy to read this that even Western teachers have fears about putting themselves out there and stress over "not knowing what to write". Thanks to everyone for doing what you do which ends up an evidence for faith for others. If you happen to visit our blog I hope you can leave a line and encourage these students. :) Thanks for the post and the comments. Thank you for sharing. I'll start a blogging experiment in class. "Because to blog is to teach yourself what you think" - well said. As a teacher who has just entered the blogospere with the intent of "learning more to teach more" about the practical uses of technology in the classroom, I have been uncertain about what the purpose really is of the whole blog thing. I seem to intrinsically understand that to move forward as a educator at this point in time is to learn how to use more than just email and power point, but I still trying to get a hold of what that means... You provided a lot of clarity for me with your post, and as other commentators have already stated, it's all summed with "to blog is to teach yourself what you think"
I just started my own blog, mostly out of necessity and curiosity as to what I have been missing by staying within the four walls of my own building (district? )Blogging is difficult, but I find myself thinking beyond what I see, to what can I do to change what I see. Technology is not my strength but I am willing to try whatever it takes. I recently started my own blog, and LOVE this post as rationalization for blogging. Blogging is for me. If anyone chooses to toss in their two cents via comments, great... but I love how you explain it as "teaching yourself what you think." My blog probably isn't interesting to most people, but it teaches me what I think, and helps me reflect on that in order to become better at what I do! Very well said. Thank you for helping me to understand why I blog, and for hopefully giving a lot of teachers out there the very best reasons to blog. Please have your young teacher in Baltimore consider this the next time he feels he brings nothing to the discussion; what would he say to any student in his class who felt the same way? Would he agree, that indeed, the young child most likely had nothing to offer? Love this posting. I blog because I enjoy blogging. I don't know how my writing will contribute to the community. It's a way for me to jot down and document my evolving thinking. Your post encouraged me, that I'm on the right track! I felt like you were talking to me personally. Thank you for your encouragement and rationale. What's cool about Blogs is that they give a place for what we used to call "reflection." And that was a radical idea too. I blog totally for my own reflection. I manage one to maintain contact with my former students and one to reflect on the complexities of being a driven urban educator and a passionate parent of 3 of my own children. I agree that the purpose of this format is reflection and even analysis of my own thinking. I don't particularly care if anyone reads my personal blog (except maybe my children and grandchildren on day), but it's there for those who need a person with which to identify...or not. Is blogging that much different from journaling? Perhaps the more intimate thoughts might be held back, and there may be a more boundaries according to a particular focus, but otherwise....what's the difference? It's public with the world. I enjoyed reading this post. I don't feel confident about expressing my inner thoughts or feelings-- it is like exposing yourself to the world-- what if I post something absurd...keeping a journal is private and more me if I want to indulge in reflective writing. Blogging requires a lot of confidence, effort and time. But this post was very encouraging. Wow. Excellent. Thanks for writing this. I am a teacher for just over 20 years of both Japanese (back in Australia) and an EFL teacher here in Japan. I have only just started my own blog regarding my teaching journey. I thought that maybe it would not really mean much to anyone. Yet, having read this I have been convinced to continue blogging. Wow, there’s really so much to learn out there and one can get overwhelmed but when you know where to focus, it’s really all worth your time and these blog designs are solid. Enjoyed your post! thanks for sharing.. Initially, I started a blog thinking I might just share some classroom management ideas but as I began writing, I began to discover the joy of expressing myself. Now I've begun to read posts by other authors which is expanding my thinking even further. I found this post a little while back, and as I continue my efforts to contribute to the blogging universe, I realize that I'm learning more about myself than creating a learning space for others. Brilliant! Pretty effective material, Your blog is really contains very nice information. Thanks for share this great site list which is very informational for me. Interesting information here. Thanks for sharing it with us.